Look beyond the caricature of Amazon workers as newly arrived coders focused on their high-stress, high-turnover jobs. The company’s collection of people defies the stereotypes: Some tinker with drones, some have lived here for decades, and some are role models. Brittany Stanton spends her days working on environmental sustainability. Evenings are for coaching the Roosevelt High School girls lacrosse team. Weekends are for exploring the Cascades — “me, the fiancé and the dog in the mountains,” she says. Despite that very Seattle profile, Stanton has been in town less than a year. The 29-year-old moved here in June for a job at Amazon, one among thousands of people the retail giant added to its workforce in its hometown last year. Stanton, who previously worked at Target in Minneapolis and had lived her entire life in Minnesota, manages Amazon’s effort to place solar panels on the roofs of its warehouses. Her fiancé found a job at Starbucks’ corporate headquarters. “The basic Seattle couple,” she said. 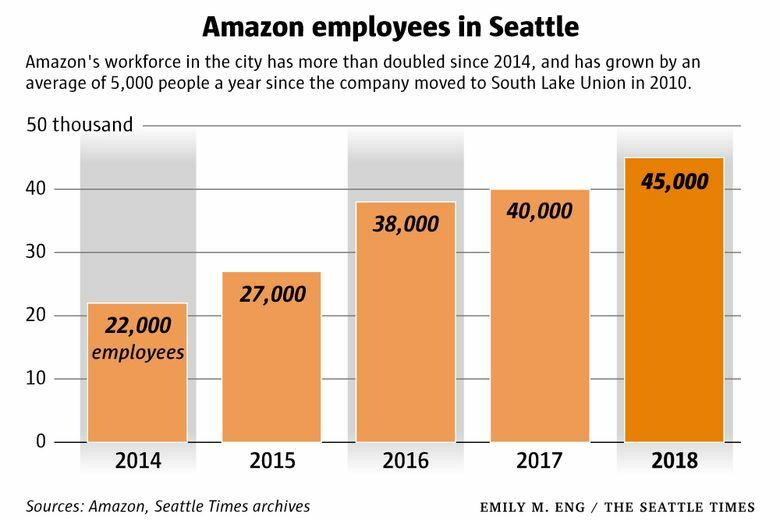 Amazon now employs more than 45,000 people in Seattle, up from about 40,000 last summer, the last time the company disclosed the size of its workforce in its hometown. The company has added an average of more than 5,000 employees in Seattle each year since 2011, turning the South Lake Union neighborhood into a corporate office park and fueling a citywide real-estate boom. In the process, the company has symbolized something of a monolith, a single word of explanation that locals deploy to describe a range of phenomena, good and bad. The cranes that dot the city. The party full of newcomers. The jump in home values and the number of people who are priced out of the housing market. The legions of 20-somethings crowding the neighborhood taprooms and buses. Beyond the caricature of Amazon workers as coders from other countries focused on their high-stress, high-turnover jobs, the company is a collection of people that defy easy description. The newcomers: Who are Seattle’s newest residents? Read more on Amazon and its HQ2 plans. They are a mix of software engineers and salespeople, business analysts and product designers, graduates of elite private schools, Midwestern land-grant universities, and Indian engineering centers. Some came to the area to work for Microsoft or Boeing first. Others had never set foot in Seattle, or the U.S., before a job offer from Amazon. They’re not all in software, it turns out — fully two-thirds of the company’s employees here do something other than software engineering, Amazon says. And though they come from diverse backgrounds, there is some commonality. Amazon, particularly in the past 10 years, has served as a magnet for ambitious people. “We’re all kind of drivers,” Stanton said. When David Zapolsky came to Seattle from New York with his wife and young son, the area was grappling with change. Traffic was on the rise. People worried about the pace of development and the availability of affordable housing. And transplants. “There was a real worry about the Californian influx,” he said. The year was 1994. Amazon wouldn’t be founded for another few months. And concerns about transplants from out of town would soon be eclipsed by a Microsoft hiring boom that fueled the growth of the suburbs and built along the eastern banks of Lake Washington some of the most affluent neighborhoods in the U.S.
Amazon’s growth in the past decade has sparked a similar transformation in Seattle, where the company is now the largest employer by a wide margin. If Amazon’s hiring continues at this rate, its campus in a few months will be home to more people than Microsoft’s sprawling headquarters in Redmond and Bellevue. Zapolsky joined Amazon a few years after moving to Seattle to run a one-man litigation team inside what was then the company’s 15-person legal group. Today, as Amazon’s general counsel, he oversees a legal department of more than 800 people. A majority of those in Seattle came to work at Amazon from outside the area, he says. One of them is Lia Moeser. She grew up in a Milwaukee suburb, playing tennis from a young age. Her father would set up early-morning matches with his male colleagues, most of whom were attorneys, to challenge her. She recalls sitting on the sideline afterward, talking with them about their day jobs, current events, politics. “I was fascinated by the conversations,” she said. Some of her sparring partners, impressed as much by her willingness to ask questions and challenge their opinions as her game, encouraged her to think about going into law. Moeser would play tennis for Northwestern University, and try her hand on the professional circuit, but law school won out in the end. She rebuffed Amazon’s first effort to recruit her from insurer Allstate, but caved when they came calling again, moving with her husband and two young children and settling in Bellevue. Zapolsky counts himself among that crowd. His 2001 Honda Civic sits parked at his Queen Anne house most days. Amazon’s top lawyer typically takes the bus — and sometimes walks — to work. Amazon says 55 percent of its Seattle employees take public transit, bike or walk to the office. Twenty percent walk, the company says. Among them is 34-year-old Erica Gomez. 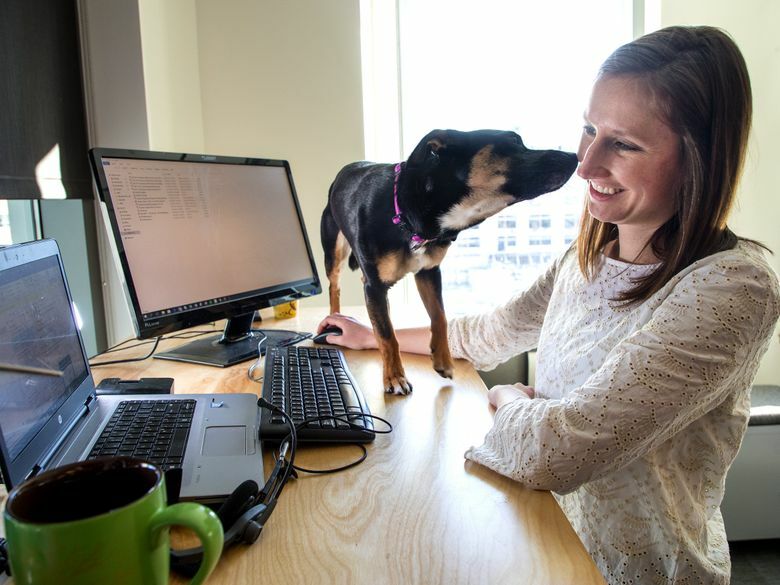 Like about 15,000 of her peers at Amazon in Seattle, she works in software development, the discipline of stringing together the lines of code that make the website tick and start the highly automated process of moving a package from a warehouse rack to a customer’s doorstep. Gomez manages the engineering behind the program for people who receive federal government food assistance, through the SNAP program, to buy groceries on Amazon. In other ways, though, Gomez stands out. She’s a woman of color, in a managerial role, in a company that is overwhelmingly white and male at its most senior ranks. 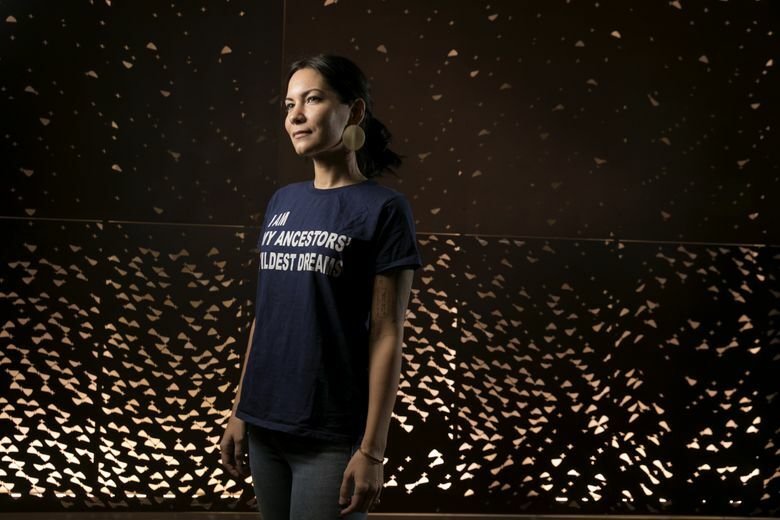 And in her profession in Seattle, more workers were born outside the U.S. than in the country. Gomez, originally from Southern California, takes her perch as a responsibility. She volunteers at a high-school training program run by Microsoft, her former employer, geared to getting more students — and particularly those from underrepresented communities — into computer science. Much of Amazon is organized into clusters of small teams. Gomez’s group pilots the engineering of the SNAP program, and peer teams oversee a small set of features of the Amazon.com retail website, or categories of consumer goods for sale. A preference for efficiency and automation runs through the company. A piece of software or business process is best, the thinking goes, if it can operate with minimum human input, and be expanded without having to duplicate work. The holy grail is to create tools “that can be reused as much as possible,” said Mike Carr, a vice president who oversees teams working on the digital plumbing behind the scenes of Amazon’s retail websites. A year ago, Carr’s team designed a training course to get new workers ramped up without an employee having to spend hours charting the unit’s structure on a whiteboard. It was partly a response to Amazon’s prodigious hiring, partly a classic Amazonian effort to engineer in some efficiency. “It’s often a frenzy around here,” Carr said. 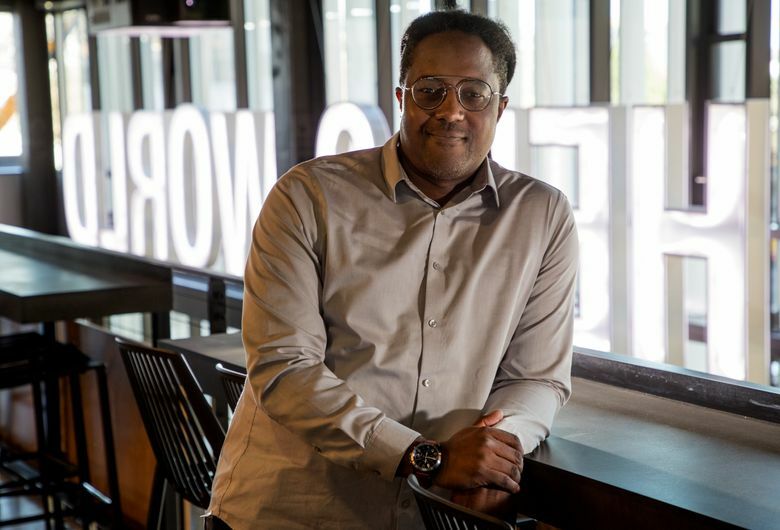 To illustrate that point, Carr, in his office on the northeast corner of Amazon’s South Lake Union campus, pulls up his calendar that is almost completely blocked out by chunks of color-coded time that stretch from 8 a.m. into the evening. Orange for one-on-one meetings. Red for encounters with the high-ups. Light green as a reminder to hold windows open for personal time. Carr is usually driving toward his Bellevue home by about 5 p.m., “before the traffic tsunami” that descends on South Lake Union. That doesn’t mean he’s done. Many Amazonians, working for a demanding company in the age of ubiquitous connectivity, are always on call. Carr’s teams oversee hundreds of website features that, if they go down, take Amazon.com offline with it. So after dinner, around 8 or 9 p.m., he’s online again. Carr tries to unplug after an hour or two. You can’t have work be the last thing in your day, he says. Some start early. Most days, Michael Ramirez is on the platform at Puyallup Station at the stroke of 5 a.m., in time to catch the first Sounder commuter train northbound toward Seattle. Ramirez isn’t headed for Amazon’s main campus in South Lake Union. In contrast to Amazonians who spend their days at a computer tinkering with code or drafting business plans, Ramirez is anchored to the physical world. From his workstation — a tool chest on wheels with two monitors sticking out, inside a lab whose location Amazon won’t disclose — he builds and repairs drones. Ramirez joined the Army out of high school in Reno, Nev., ultimately specializing in helicopter maintenance at Joint Base Lewis-McChord. A lot of what he did during his six years in the service, which included a couple of stints in Afghanistan, he can’t talk about much. The unclassified highlights: Chinook transport helicopters, modified for special operations missions, took off at night. By day, Ramirez and his technicians repaired damaged aircraft and kept the rest in working order for the next mission. 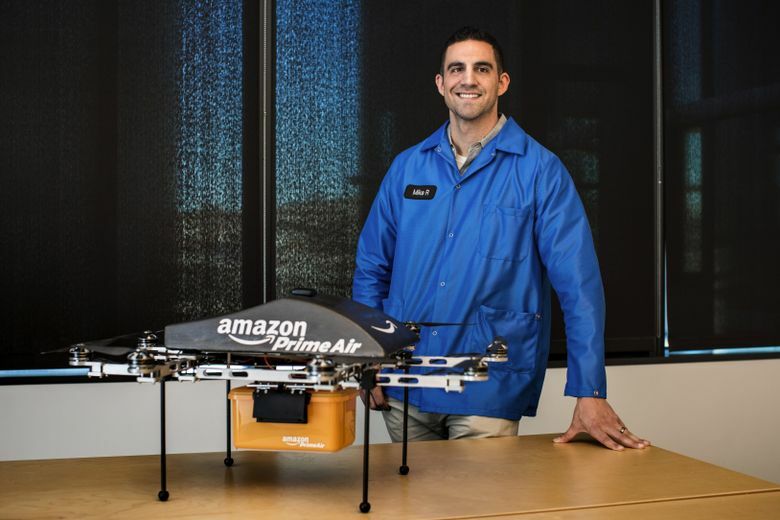 When Ramirez and his wife decided a few years ago that he would look for civilian jobs rather than make a career in the military, he was surprised to encounter an Amazon job listing among the first he saw. The company was seeking someone to help build a drone assembly and testing program up to commercial-aviation-grade standards. And quickly. In Seattle, Amazon is a high-tech software and logistics company. Employees at headquarters report their pay averages $110,000, according to an analysis of the 68 most common job titles at the company posted to review site Glassdoor. But in most communities across the U.S., the nearest Amazonian probably works in a warehouse, taking items off a shelf or placing them into a delivery truck. Starting rates for those jobs run between $11 and $16 an hour, according to Amazon’s jobs page. Few who got their start on that side of the business are represented at Amazon’s campus in Seattle. One is Cedric Ross, who manages the tours program for the public to see inside Amazon’s warehouses. 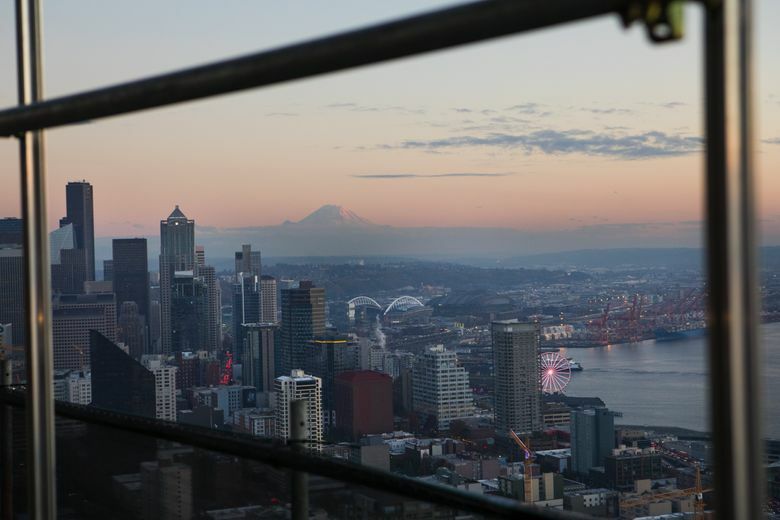 What changes have you seen in Seattle recently? We want to know. Ross grew up in the Tacoma area. He briefly rode the cresting wave of Seattle’s music scene in the early 1990s, manning the bass for a funk-rock group called Imij. That is Jimi, as in Hendrix, backward. The band opened for funk legend Bootsy Collins and signed to an imprint of Capitol Records. But after a management change, they never cut a record with the label. Ross, who didn’t expect music to pay the bills for long, has no regrets. “I was a struggling musician for four years, and I was a rock star for eight months,” he said. After a few years in roofing, Ross joined Amazon in 1997 in shipping and receiving in what was then the online retailer’s only warehouse, in Seattle’s Sodo District. One day, the boss asked him to lead a tour for visiting French journalists. That led to more tours, and, eventually, roles analyzing the efficiency of Amazon’s warehouses and setting up training programs for Amazon’s expanding network of depots. 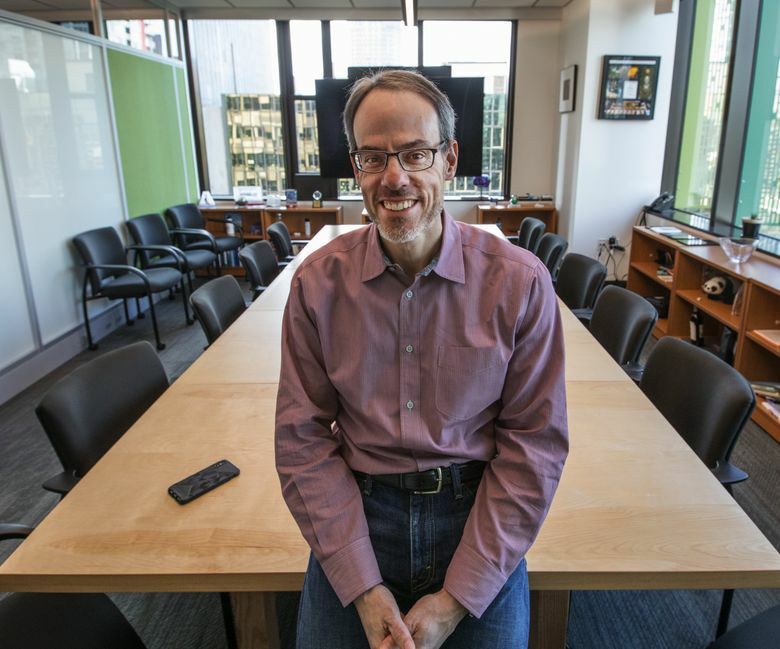 Ross left the company in 2007 to consult for other Seattle firms, a seven-year hiatus that ended when Amazon asked him to return to lead a newly expanded warehouse tours program. Amazon’s corporate culture felt largely the same upon his return, he said. But the company’s scale — far broader than that of the “internet bookseller” whose help-wanted advertisement he clipped more than 20 years ago — amazed him.